The neighborhood of New Monterey encompasses homes sitting just 4 blocks up from famous Cannery Row, at an elevation of 56 feet which allows for views of the remarkable Monterey Bay. The neighborhood is bordered by David Avenue, Hawthorne Street and Private Bolio Road. One block past the neighborhood border will take you to Lighthouse Avenue, an eclectic collection of 120 shops, restaurants and services known as the Lighthouse District. A focus for the city of Monterey’s development efforts, the avenue is an up and coming area enjoyed by locals and tourists alike. There are numerous salons, vintage clothing stores, ethnic restaurants, fitness studios, offices and stores for picking up everyday essentials. Just three streets past Lighthouse towards the Monterey Bay you will find Cannery Row, a destination spot in the historic waterfront district of New Monterey. Brought to literary life by author John Steinbeck, Cannery Row is rich in history from the days of sardine fishing and canning, the last cannery was closed in 1973. Located at the north end of Cannery Row, Monterey Aquarium transports visitors into an undersea world of adventure and discovery. With an annual attendance of 1.8 million visitors, upon visiting just once you will understand the magnetic draw of this exceptional aquarium. Fresh ocean water from the Monterey Bay is continuously pumped into the aquarium waters providing an environment that mimics the bay and its inhabitants. Children and adults alike will be mesmerized by the glowing jellyfish, intricate seahorses, playful otters, eerie sharks and giant kelp forests. Cannery Row also has numerous hotels, restaurants, shops and galleries to browse as you stroll through this vibrant section of town. As of February 23rd, 2015 homes in the New Monterey neighborhood range in price from $749,000 for a 3 bedroom, 2 bathroom home with 1,542 SqFt of living space on a 5,008 SqFt lot to $525,000 for a 2 bedroom, 2 bathroom home with 911 SqFt of living space on a 2,178 Sqft lot. Click here to view all homes for sale in the New Monterey neighborhood. For all available Monterey real estate, click here. In 2014, 35 homes sold in this neighborhood. The most expensive home sold for $1,100,000 for a 5 bedroom, 3.5 bathroom, 2,491 SqFt of living space with Ocean views situated on a 5,850 SqFt lot while the least expensive was a 773 SqFt home with 2 bedrooms, 1 bathroom which sold for $327,000. In 2013, the most expensive home sold in the neighborhood was a 24,000 SqFt home on 10,000 SqFt of land, which sold for $825,000, while the least expensive was a 714 SqFt home on 5,000 SqFt of land, which sold for 250,000. In the year 2012 there were 51 home sales in the New Monterey neighborhood. The most expensive home sold for just over one million and was a 3 bedroom 2+ bath newly constructed home with 2,239 SqFt of living space situated on a 5,850 SqFt lot. This home had expansive bay views. The least expensive home sold was a 1 bedroom 1 bath “fixer” home with 542 SqFt of living space on a 2,500 SqFt lot. For a detailed analysis of Monterey real estate sales, check out our monthly Community Market Reports. To live in New Monterey is to live in a dynamic and active section of the city. 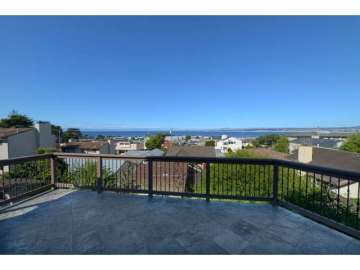 Homes in this up and coming neighborhood are desirable for their views of the Monterey Bay, well maintained homes and excellent proximity to activities and recreation. It is also a very convenient place to call home as much of your daily shopping and errands can be accomplished within walking distance. The neighborhood also enjoys sunny, fog-free weather at times when the coast is soupy and gray. Imagine waking up to views of the blue sparkling Monterey Bay and simply walking out the door to begin your adventures for the day. Perhaps you will spend the morning at the aquarium, followed by lunch at one of the neighborhoods many great dining spots or window shopping on Lighthouse Avenue. Perhaps you will hop on the Monterey Bay Coastal trail and cycle along the waterfront into Pacific Grove or to Ford Ord which has miles of paved pathways along the sand dunes and ocean vistas. Driving into Pebble Beach is great for recreation along the shore, dining at the luxury resorts or checking out an event such as the annual AT&T Pro Am Golf Tournament of the Concours d’Elegance each August which showcases the rarest of automobiles from collections around the world. Or maybe you will enjoy spending the day at one of Monterey’s many parks, or take a paddleboat ride at El Estero Lake across the street from the Monterey State Beach Seashore where there is always a volleyball game to join or a perfect spot available for your picnic. There are countless options for enjoying life in New Monterey and the area is experiencing a surge of activity and interest. What a dynamic and unique community to call home.